← The Strange Range Tweetup! Welcome to Yellowknife! Hope you brought a fork! Bowhead Whale Hunt by Glenn Williams. Didja bring yer fork? Wanna see the Food Chart the government distributes? Well, you will just have to wait till I’ve figured out how to convert PDFs to PNGs on this damn computer! Om to the nom nom! 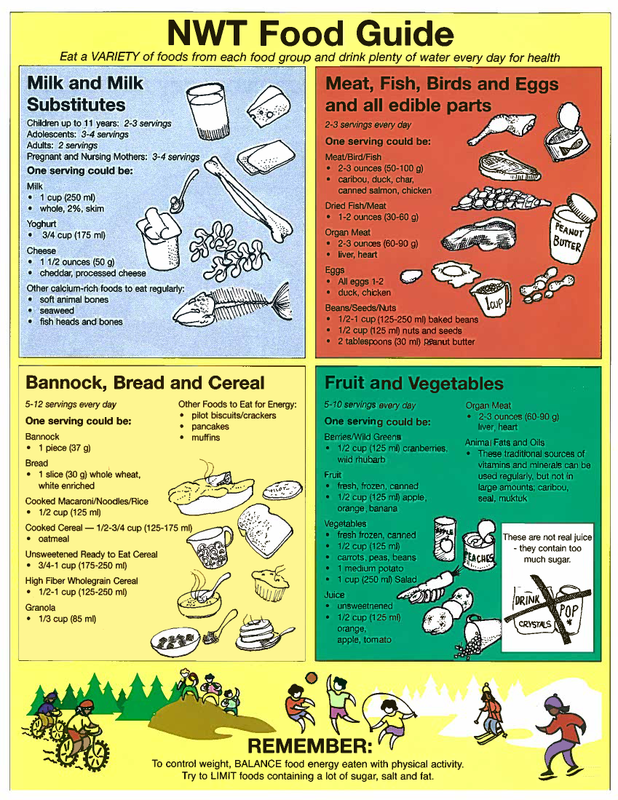 The NWT Food Guide! 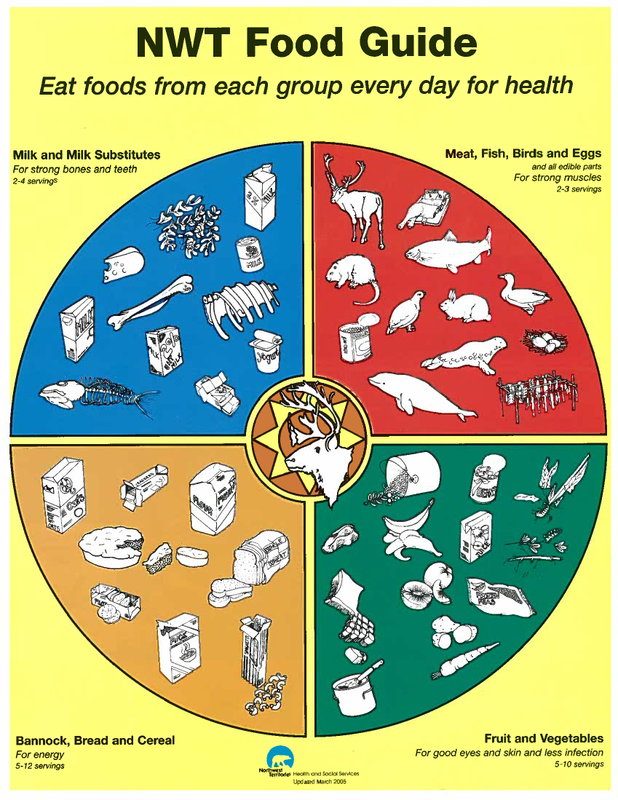 Yes, that is a rat on the food chart. And seaweed. And fish bones. And a Beluga Whale. And yes, they are endangered. I heard they had to take the chicken leg in the grocery store packaging out of the new edition, because nobody knew what it was. They eat a lot of what is called “country foods” up here: outside of Yellowknife, something like 45% of families get 40% or more of their food off the land or from the sea. You don’t have to go to the Amazon to find hunter-gatherers, and frankly having sussed out the grocery stores here I’m thinking of trying it myself. So there I was back a few months ago, minding everyone else`s business on social media, as one does (if one is this one), and I found out there was an actual, honest-to-god French chef in Yellowknife. Well, naturally I thought someone was pulling my leg; as far as I know not even Julia Child would have attempted to Frenchify a hunk o’ musk ox. 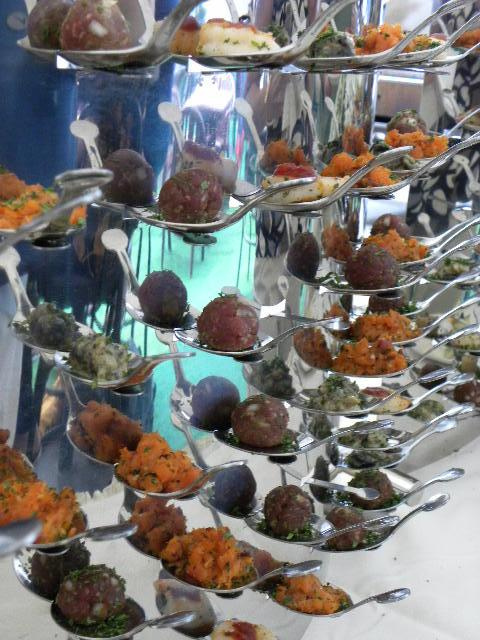 Le Chef Pierre doesn`t mess around. You should see what happened to the last Top Chef in Yellowknife. Le Chef Pierre does exist, and not only does he exist, but he Follows me on Twitter, which as far as I`m concerned is truly the only authoritative signifier of meaningful existence. Naturellement. And once I`d moved up here and he found out I`d been born in France, he went ahead and invited me and my friend MoneyCoach to the Bastille Day celebration at his very civilized French restaurant, Le Frolic. Now, as we`ve firmly established around these parts, a lot of my favorite words start with F; I don`t need to list them, do I? But the greatest of these is “Free.” Somehow, the psychic Chef Pierre sussed this out (what are the odds, eh?) and that is how I, my camera, and my best YK pal ended up freeloading our own bodyweight in steak tartare and cab sauv under the shadow of a three-story-tall red-white-and-blue model of the Eiffel Tower (where do they keep it the rest of the year?) or maybe that was just me. Yeah, that was just me. Nancy’s a light eater, and I’m a lifelong believer in the calorie-free nature of food which you didn’t pay for. In related news: food is also zero calorie if eaten standing up, by the light of the fridge. Very few people know that. Well, if you flick through the Flickr pix you can see many things: bruschetta, amuse-gueules on a very snazzy steel presentation stand, a assortment of wines the list of which I had in my backpack until it rained, so sorry wine sponsors, no names in the post! and a trayfull of desserts, of which I only tried the butter tart, being a butter tart snob of the old school. Those of you who are Canuck Foodie Purists will be relieved to know that Chef Pierre is solidly of the “no nuts in the butter tarts” school. I’m glad I could take your mind off that worry. I was equally fascinated by the butter tart, as you can tell from the what, six pictures I took of it? Well, it was an uncooperative model, so I did my best. “Look up, baby! Work it! That’s it, that’s it, gorgeous, now more animalistic!” Oh, I tried my best, but the damn tart just wasn’t having it; I felt like David Bailey before he found his mojo (I understand he found it in his other pants). This entry was posted in Canada, Culture, food, Lush Life, raincoaster, Travel, wine, Yellowknife. Bookmark the permalink. Your day in Yellowknife looks tres rustique. It was rather civilized. Yesterday was rustique: I saw two foxes and a lynx. I’m going to put those charts on my fridge to remind myself to get enough rat back into my diet. Any chance you are actually living in Ankh-Morpork? Not yet, but stay tuned. Anything’s possible.